In this page we'll learn about continuous compound interest and number e. Even if you're not much interested in finance, you may want to read on anyway, because here we introduce some important notions, specially number e and new ways of seeing the exponential function. The principle behind continuous compound interest is present in many natural processes. It is a universal law that could also be called the law of organic growth. This law applies when the growth of some quantity is proportional to the quantity that exists at the present time. This type of rate is called organic because this is what happens in some circumstances in nature: the growth of an organism is proportional to the size of the organism. We'll use the example of continuous compound interest because it is the most practical, and knowing this stuff can be useful in your life. In the last section of this page we'll also apply our definition of number e and the exponential function to calculate some limits. To introduce number e, we'll use the example of continuous compound interest. Let's first review how simple interest works. Let's say you have 1$ in the bank. Your bank says that their rate is 100%, per year. This means that at the end of the first year, you'll receive 1 extra dollar. You doubled your capital, now you have 2$. This is how simple interest works. As its name says, really simple. Your bank implemented a new, "fairer" policy. Before, you were paid your interest only at the end of the year. Now they pay you 50% interest per half-year. That is, after half a year, you receive 50% of interest calculated on the capital you kept from the beginning of the year. Notice that in the second line we factor (1+1/2) and we obtain a more comfortable algebraic expression. Now, let's say that your bank becomes even more generous and instead of just two payments a year, they pay 33% (one third) of interest three times per year. This is an interesting way of defining a number. This number is defined as the amount of capital you'll have, after 1 year, by depositing 1$ into an account that pays 100% of continuous compound interest per year. This number not only appears in finance, but in many other places. This is because the principle behind compound interest is a very simple and universal one: the rate of growth of one quantity at a specific instant is proportional to the quantity present at that instant. 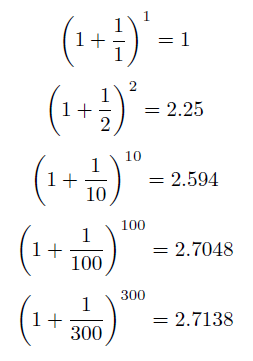 Notice that the limit converges rapidly to a fixed number. For example, the difference in the values for n=100 and n=300 is not that big. Here we are considering x as a positive number because, remember, it represents an amount of money. From this expression we can conclude that if n approaches infinity, m also approaches infinity. Also, if m approaches infinity, n also approaches infinity. We can think of the x in the exponent on the right side as representing multiplying the expression on brackets "x times". This interpretation is correct when x is an integer, but not when x is a non-integer real number. Anyway, the property we need to use now is valid for any x, integer or not. With this, we can understand the expression e^x intuitively as the amount of money you'll have after one year of depositing x$ in a 100% continuous compound interest account. This is a fun way of seeing the exponential function. 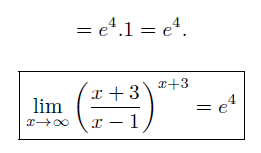 There is another way of seeing the exponential function: as a series. Series is a topic you'll learn later on, but this particular series is so important that I consider it useful to define it now. When learning about derivatives, this series expression will be useful for showing the important properties of the exponential function. Notice that the sum on the right side continues forever, it is an infinite sum. An infinite sum is called a series. This expression of the exponential function as a series is so useful that many times is used as its definition. You'll learn much more about it and other series later. There is one last application of the exponential function that we'll learn on this page. The definition of the exponential function as a limit also helps us in the calculation of some other limits. Specifically, it helps in limits where there are expressions resembling the definition of e. Let's go directly to some examples. Here we used the fact that the limit of a quotient equals the quotient of the limits.